If you want to get a European living in the US riled up about something, start discussing vacation time. Most American companies give their employees two weeks paid vacation every year. In that small window of time, we’re supposed to fit in family visits, time with children, vacation and (well, maybe) rest and relaxation. Could anyone possibly do that in ten workdays? Working conditions are rapidly changing, even in larger companies. We are no longer working strict nine to five jobs, the number of people working from home is growing, and we are expected to be available on email outside of working hours. So if employees are expected to be flexible about how we work, shouldn’t employers be willing to cut us some slack when it comes to vacation time? Virgin CEO Richard Branson thinks so. 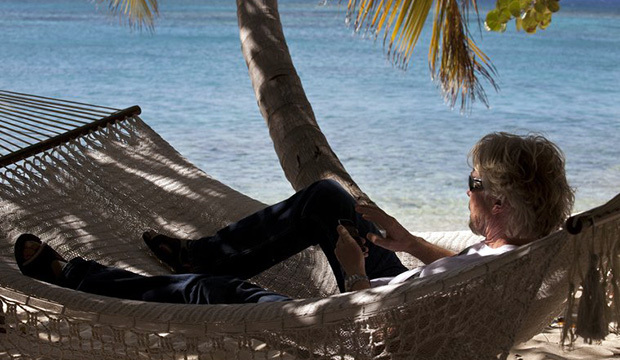 In a blog post and in his book The Virgin Way, Branson — one of the world’s most successful businessmen — talks about why he’s decided to give his employees as much vacation time as they want. Taking inspiration from Netflix, another highly successful company that has instituted this kind of vacation policy, Branson says he feels the emphasis should be on what people actually get done, not how many hours they work, and that employers should trust their employees to take time off only as their work duties allow. “Treat people as human beings, give them that flexibility and I don’t think they’ll abuse it. And they’ll get the job done,” Branson told CNN’s Erin Burnett in an interview (below). This new policy currently applies to about 160 Virgin employees. If successful, other Virgin subsidiaries are expected to follow suit. It’s a refreshing move by Branson, and if it works as expected Virgin will without a doubt experience a surge in happiness among employees. The real question is, can we overcome our cultural bias toward workaholism and actually start rewarding — not looking down upon — employees who prioritize time off? It’s an interesting question that maybe this Virgin experiment will help us answer. Because wouldn’t it be nice to feel like you could take a few weeks off during the holidays without sacrificing your vacation allowance for the rest of the year?